You can pay for your eBay purchases in several ways, but eBay allows sellers to show only electronic payment methods. The eBay seller isn’t required to accept any form of payment except PayPal or one of the other electronic payment options (ProPay, Paymate, Moneybookers, or a merchant account). If you want to make a payment in the form of a check or money order, use the Ask a Question link that you find on an item listing and ask whether you can! Credit card: Paying with a credit card is a favorite payment option for many buyers, one that’s offered mainly by businesses and Dealers credit cards are fast and efficient, and your credit card company can help you if you’re not completely satisfied with the transaction. Credit cards can also be used for payment through the other electronic payment options (such as PayPal) that a seller may offer. Sometimes sellers use a friend’s company to run credit card payments for eBay auctions. So don’t be surprised if you buy a vintage Tonka bulldozer, and your credit card is billed from Holly’s Hair-o-Rama. PayPal: Owned by eBay, PayPal is the largest Internet-wide payment network. 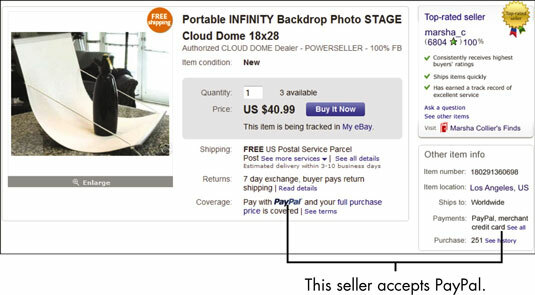 Sellers who accept PayPal are identified in the Seller Info box and a PayPal logo in the item description. PayPal allows these sellers to accept MasterCard, Visa, American Express, and Discover as well as electronic checks and debits. The service is integrated directly into eBay auctions, so paying is a mouse click away. Money order: Sellers love money orders because they don’t have to wait for a check to clear. Money orders are the same as cash. As soon as the seller gets your money order, he or she has no reason to wait to send the item. You can buy money orders at banks, supermarkets, convenience stores, and your local post office. The average cost is about a dollar. Personal or cashier’s check: Again, you have to ask the seller whether he or she will accept a check. Paying by check is convenient but has its drawbacks. Most sellers won’t ship you the goods until after your check clears, which means a lag time of a couple of weeks or more. The good news about checks is that you can track whether or not they’ve been cashed. The bad news about checks is that you’re revealing personal information, such as your bank account number, to a stranger. Cashier’s checks are available at your bank but often cost much more than a money order. It’s not worth the extra money — have fun and buy more eBay items instead. Never use a form of payment that doesn’t let you keep a paper trail. Don’t wire money, and never send cash in the mail! If a seller asks for cash, just say no. Chances are that you may never see the item or your money again. If a seller asks you to send your payment to a post office box, get a phone number. Many legitimate sellers use post office boxes, but so do the bad guys.